Drake says: "This is the third installment in the best-selling Ticket To Ride series. The board is based on a map of Germany and each individual card in the deck depicts a different Märklin Trains model. A DVD introducing players to the Märklin line of model trains is included. Passenger figures are used to pick up merchandise tokens worth different numbers of points along the routes that they claim. Also, the player who completes the most destination tickets receives a 10 point bonus (instead of the base game's longest route bonus)." John says: "This edition of Ticket To Ride is considered my most gamers to be the most challenging. Märklin is excellent with 2 players. Balanced and challenging gameplay make this one a favorite!" Ticket To Ride - Marklin Edition is the third installment in Days of Wonder's best-selling boardgame series that has won 14 international game awards, including the prestigious Spiel des Jahres. 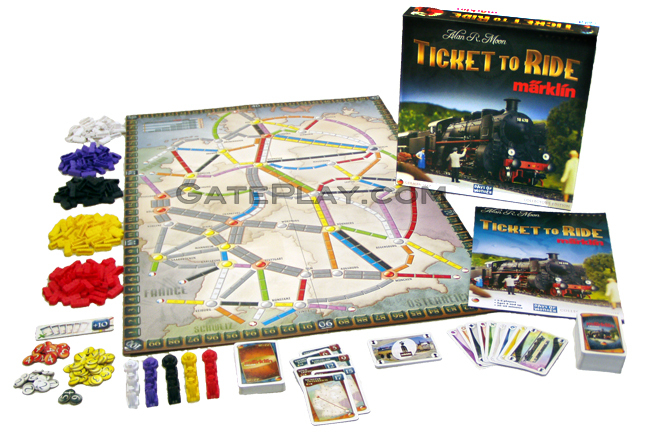 The boardmap for the Marklin Edition is based on a map of Germany and introduces Passengers and Merchandise to the Ticket to Ride gameplay. Passengers are used to pick up merchandise worth different numbers of points along the routes that they claim. Varying stacks of merchandise tokens with different point values are placed next to the different cities on the map. Players can place one of their 3 Passenger tokens on any city along a route that they claim. On his game turn, the player can choose to then move one of his passengers from the city it currently occupies along any or all of his continuous routes, picking up Merchandise Tokens from each city he moves through. Of course he'll always take the highest remaining tokens. The point total of the tokens is then added to his score. Other game play changes are the vertical orientation of the German map, and instead of a bonus for longest route, the 10 point bonus card goes to the player who completes the most Destination Tickets. While boardgamers may not be familiar with the Marklin name, train hobbyists consider it the premier name in the model train world. This German company has been around for over 140 years and is the world's leader in the miniature train hobby. Each train card in this edition will feature a different image (118 in all) of a Marklin model train car or locomotive. Check out "Ticket To Ride: Märklin" on BoardGameGeek.com! Check out "Ticket To Ride: Märklin" on KidGameRatings.com!